Florida country living at it's best! This is a horse lovers dream offering 35 +/- acres located in the desirable buckingham community! Close to everything yet nestled into a secluded ranch with an endless amount of possibilities. The property was previously split and can be separated again to offer multiple home sites. All improvements are on one 10 acre piece. This 3 story home includes beautiful cedar siding, 4 bedrooms, 4. 5 bathrooms with the 4th bedroom being a mother-in-law quarters located on the ground floor. There is a screened pool with spa, a private sauna, 25k generator that turns on 20 seconds after loosing power! There is also a 500 gallon holding tank for propane, solar hot water heater with circulating pump, video surveillance system, hurricane shutters, 2 ac units, fire hoses and hook ups, 500 gallon holding tank for water, gas stove, and much more! As if that isn't enough. There's more! A lighted arena, an 8 stall barn, a 6 stall barn, a pole barn, 4 ponds, 2 sheds, an air compressor, and cow pens. Do not miss out on this unique piece of property! The seller will consider offers to divide this property. 10 acres right on the caloosahatchee river in beautiful east fort myers. 336 feet on the river with access via a boat ramp and potential dock. Perfect for country estate home, equestrian ranch or residential subdivision. Land use is suburban which allows six units to the acre. Large ranch style home situated on 2. 39 acres with many features for all hobbies. Home has been richly renovated and finished very nicely. New flooring, appliances, gourmet kitchen with island and stainless steel appliances. Bathrooms have been updated with new vanities and faucets. Large screen enclosed in ground concrete pool area for entertaining, tennis court for the active, large barn with doors for access of large toys and your equipment with guest suite on upper level. Fenced back pasture area for those wishing to have their livestock. Much more, must see to appreciate. This property is unique and is ready for occupancy and enjoyment. Located close to shopping, dining, rsw airport, medical and beaches. Electronic gate for access to property. Investment opportunity! 22. 55+/- acres with over 930' of sr 31 frontage, across the street from newly renovated with expansions, sweetwater marina and the new boathouse 31 tiki bar and lounge. Just a few miles from babcock ranch. Access to river from the northeast part of the property. Zoned for residential planned development (rpd) for a maximum of 60 multi-family units. This area is booming, don't miss your chance to be a part of it. 3 story beautifully renovated ranch home sitting on 2. 5 acres. 3 bedrooms and 3 full baths, custom cabinets in kitchen with laminated wood floors throughout the home, master bedroom suite with large master bath and extra bathroom downstairs attached to home for easy cleanup of the yard, fruit trees spread throughout, completely fenced. Plenty of room for pool, large pond stocked with grass carp and full irrigation sprinkler system in front part of home. Beautiful landscaped lot that is often used and rented out for parties, weddings, children's birthdays, thus an additional income on the ranch is available-details can be supplied. 4 beautiful maintained large oak trees decorated with spiral lights and hanging chandeliers. 2nd floor wrap around screened country porch is ideal for cooling off and viewing the beautiful sw florida sunsets facing west. Secured garage used for storage or additional living space of 1500' if wanted. Home is elevated therefore never has flooding issues when heavy rains. Owner finance available with special terms upon request. Recently completely remodeled*from the grand double door entry you will be impressed w/the wall of glass sliders leading to a private backyard oasis w/large screened patio & fenced yard backing to lakes park reserve*this split b/r ranch home is p-e-r-f-e-c-t*no expense was spared*some new features include: european wide plank white oak floors w/5 1/2 trim*remodeled baths w/stunning cambria quartz counters-master bath w/double sided step in shower*newer a/c*all new hardware & faucets thru-out*closet systems*freshly painted*nest wireless therm*sitting area in the master suite opens to the covered lanai*granite counters & new upscale appliances in the gourmet kitchen*brick paved driveway*its hurricane protected too! *low hoa dues include: a well maintained gated neighborhood, lakes, green space, pool, club house, exercise room, playground, tennis, basketball, billiards, etc*plus the path to lakes park is just steps away! *enjoy the farmers market, boat, bike & train rides*this is a super area*close to 41 w/all the restaurants, shopping, theater & health care*minutes to i-75, fort myers airport & the beaches*its close to everything you could possibly need! Check out the virtual tour! C. 15672 - come and see this beautifully updated home nestled in the desirable whiskey creek estates neighborhood with a circular driveway. This sprawling ranch was a quality built home from the start and now has all the features your buyer is looking for, including hardwood floors and tile throughout. It is a pool home and has 2 master suites, 2 additional bedrooms, and another bath for your guests. It sits on a nice lot with gorgeous views of the whiskey creek golf course. Relax with your friends and family in the pool and enjoy dinner and cocktails on the lanai. Your children and pets can play in the fenced in yard. The kitchen and all bathrooms have been painted and remodeled with new granite tops and cabinets. Walk-in closets and plenty of storage come with this one. Including 2-car garage with extra storage inside. Schedule your showing today as the property will not last long!!! New pool heater and irrigation pump have been installed. -An aviators must see. 3/2 ground level ranch home on double lot next to vacant lots. Hanger plans & permits approved for 60'x60' hanger , one of the largest res on-site hangers in swfl. Plans provide for a 50'x14' hydro-swing door & 2nd flr loft & office. 65% complete. Sold as-is. Home is bright and open with tile flooring, vaulted beam ceiling, picture windows. 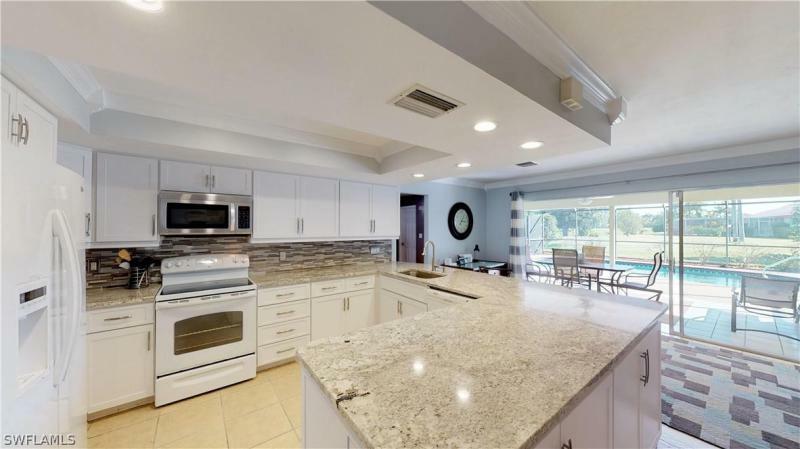 Remodeled, open island kitchen complete with newer appliances & gas granite fireplace in living area. Brick pavers surround home as well as new landscaping. Buckingham air park is a residential community of 50 homes located adjacent to a small airport near ft myers, located on a site of the former buckingham flexible gunnery school, a world war ii facility. Many of the homes in the community are fly & live with on-site hangers. Located 6 miles north of rsw and the official designation is fl59 & 122. 9 is the common advisory frequency. Runway is 14/32, 4,000 ft long, 400 ft wide, hard surface concrete. 6751 school ln is the perfect home for aviators & adult toy collectors. Adorable and beautifully updated 3 bedroom ranch style home located within the mcgregor woods enclave. Mature oak trees and gorgeous curb appeal surround this terrific family friendly street and development. Wonderfully appointed with newer kitchen and tasteful interior upgrades. Private master suite with split guest bedroom floor plan. Separate dining and family rooms. Relaxing screened in lanai overlooking a special and intimate back yard. New electrical panel and garage door. A very special home in a splendid neighborhood - close to schools, sanibel beaches, shopping and restaurants. Beautiful, mostly updated, move in ready ranch home on river side of mcgregor blvd. 2bd/2ba+den with heated pool & spa. This home's light and bright floor plan offers a 36 x 15 living room featuring a wall of hurricane impact double french doors leading out to the stunning very private pool. Screen enclosed, custom designed, energy efficient with led lighting, sun shelf, waterfall and fountain features and unique spa. All this surrounded by paver pool deck with large patio area perfect for grilling, entertaining and outside dining. The eat-in-kitchen is gorgeous with travertine tile and beautiful hardwood cabinetry, stainless steel appliances and stunning vent hood above the stove make this an enviable cooking experience. In addition to the 2 bedrooms you'll find a sunny den/office with a custom two way book shelf and window overlooking the pool. The terrazzo floors have been ground and polished to like new. The laundry room offers additional storage, cabinet and counter top space. A graceful circle drive, large front porch and mature landscaping give this home real curb appeal. A one of a kind offering. Make an appointment right away to see this one before it's too late. As of today, 4/26/2019 the average home price for homes for sale in Fort Myers is $349,172.